Capoeira is the Brazilian martial art best known for its dancelike nature. Capoeira acrobatics include flying kicks and handstands that are flashy and deadly. But the most powerful movements are also the most difficult to perform safely. It can take years to learn some of the more complex nuances of the style. 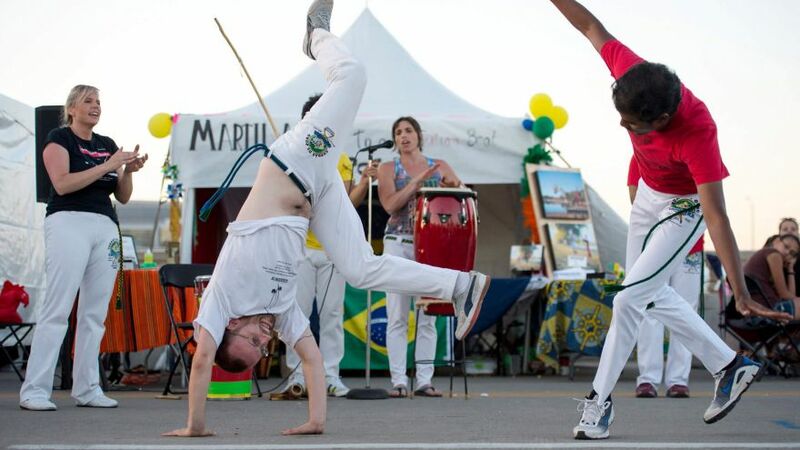 Capoeira acrobatics are all about distracting flair and unconventional strikes. A style designed by slaves and honed in the streets over centuries, it has a firm foundation in combat. But the acrobatic nature of this style demands amazing conditioning and timing. That is one reason capoeiristas practice to music in the rodas. Capoeira is best known for the daring acrobatics capoeiristas perform. Handstands, Cartwheels, spins, and flips look like a wild dance as practitioners try to outthink and outmaneuver their enemies. The unusual movements hide surprising power and combat effectiveness despite their flashy nature. Many advanced moves contain the same building blocks as basic moves. They also require a significant amount of technique and safety equipment to avoid hurting yourself. One of the best ways to avoid injury is to train regularly. Mainly by strengthening the muscle groups needed to perform the most intense and powerful moves. Capoeira acrobatics allow the capoeirista to attack from any angle in a single, fluid movement. This provides a positional advantage for the capoeirista in a fight, causing enemies to never know where an attack will come from. The more positions you can reliably hit, the more dangerous you become on and off the mat. But capoeiristas also need to have enough stamina to outlast their opponents. Handstands, bridges and elbow levers and kicks are core movements of capoeira that take an awful lot of energy and strength to perform properly. In order to achieve the tone and power needed to propel their bodies quickly, capoeiristas constantly train. Flying kicks and cartwheel bridges stretch the limits of what the body can do. Even the fittest person on the planet can hurt themselves performing capoeira acrobatics. So safety is a key concern of any professional martial artist. Make sure to consult your healthcare provider before starting any exercise routine or other strenuous life change. Each of the programs below target a specific aspect of capoeira training. Acrobatics, strength, and balance are the core elements needed in a good martial artist, not just for this style. But the moves below are specially designed to bolster your current abilities without unneeded risk. The Martelo is an advanced move that shows off capoeira’s roots. Similar to a roundhouse kick, this difficult move builds strength in core muscles. It also stretches the legs, making it great for increasing range of motion. Perform these exercises slowly with a focus on control for the best results. Begin the move from the Ginga position with feet hip-width apart and arms out. Raise your right leg and kick it out to the side at a 90-degree angle to your other leg. Don’t forget to bend the leg at the knee on the way up and tilt your body slightly to counterbalance. Return to the Ginga before repeating on the other side. Continue until you reach 3 sets with 10 reps per side. This should provide a solid burn with minimal chance of injury. This exercise is perfect for solo training or with a small roda.